DENVER - Once the province of activists and stoners, the traditional pot holiday of April 20 has gone mainstream in the first state in the nation to legalize recreational marijuana. Tens of thousands gathered for a weekend of Colorado cannabis-themed festivals and entertainment, from a marijuana industry expo called the Cannabis Cup at a trade center north of downtown, to 4/20-themed concerts at the legendary Red Rocks Amphitheater - acts include Slightly Stoopid and Snoop Dog - to a massive festival in the shadow of the state capitol where clouds of cannabis smoke are expected to waft at 4:20 p.m. MDT Sunday. Previous years only allowed medical patients but since marijuana is now legal in Colorado this is the first time the event is open to all adults 21 and older. Thousands waited to partake in Cannabis Cup Denver on Saturday, reports CBS Denver. The sold out event stipulates that no selling of marijuana is allowed but smoking is in designated areas. Vendors like Peter Runyon from Mountain Sights Souvenirs say sales have grown tremendously with many coming from out of state. "Now that it's legal, boom," said Runyon. Organizers estimate about 37,000 people will attend the event through the weekend - more than double last year's record. The festival in Denver's Civic Center Park is the most visible sign of the transformation. It started as a defiant gathering of marijuana activists, but this year the event has an official city permit, is organized by an events management company and featured booths selling funnel cakes and Greek food next to kiosks hawking hemp lollipops and glass pipes. 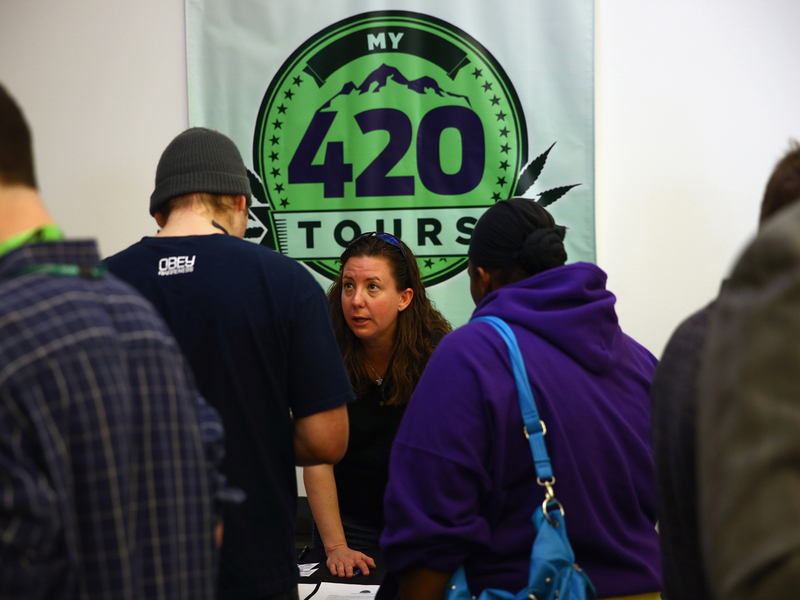 Gavin Beldt, one of the organizers, said in a statement that the event is now a "celebration of legal status for its use in Colorado and our launch of an exciting new experience for those attending. " On Saturday, the first day of the two-day festival, only a few people lingered on the steps of a Roman-style amphitheater where marijuana activists spoke angrily about bans on the drug in other states. Thousands instead lingered on the park's broad lawns, listening to hip-hop music blasting from the sound stage and enjoying the fresh, albeit marijuana-scented, air. "It's a lot mellower this year," said Cody Andrews, 29, of Denver. "It's more of a venue now. More vendor-y." Last year's event was marred by a shooting that wounded three and is still unsolved. This year a fence rings the park, armored security guards roamed the grounds and all entrants were patted down for weapons. There was also tension earlier in the year when some organizers wanted to officially sanction the 4:20 pm Sunday smokeout, but the city noted that public consumption of marijuana is still illegal in Colorado. By Saturday night, Denver police said they had issued at least 17 citations for public pot smoking. Still, participants expect to light up on Sunday, which happens to also be Easter Sunday. Plenty weren't waiting until 4/20 proper. On Saturday, Jairin Genung, 25, of Aurora, sat on the grass with friends, including one who was carefully rolling a thick joint. "We're going to light up no matter what," Genung said. "If you can't smoke at the 4/20 rally, it just doesn't make sense." The whole scene was wonderfully surreal for Bud Long, 49, from Kalamazoo, Mich., who recalled taking part in his first 4/20 protest in 1984. "Nationwide, it'll be decriminalized," he predicted, "and we'll be doing this in every state."